Two days into the 2016 SheSays China Open and finally Malaysia has a victory, after Choong Javen and Leong Chee Feng partnered up to win their Round of 16 Men's Doubles tie. Malaysia saw all of their competitors lose on the opening day in Chengdu, and to make matters worse Haiqal Muhamed Ashraf and Ibrahim Muhd Shakirin were forced to withdraw giving USA’s Wally Green and Wenzhang Tao a walkover victory on day two. However, Choong Javen and Leong Chee Feng are still in the Men’s Doubles competition following their victory against Omer Avi-Tal (Panama) and Kevin Soto (Guatemala). Choong and Leong started well, establishing a 2-0 advantage and dropping just seven points across the two games but the combination of Avi-Tal and Soto managed to pull one back to lower the games difference to one. With the scores at 2-1 in the best of five match, the tie was till wide open for either partnership to progress. But in the end it was the Malaysian duo of Choong and Leong who prevailed (11-4, 11-3, 6-11, 11-6) to book a quarter-finals encounter with Hong Kong’s Wong Chun Ting and Ho Kwan Kit. The other Men’s Doubles last 16 match featured Korea Republic’s Kim Minseok and Kim Donghyun taking on Yang Heng-Wei and Tsai Chun-Yu of Chinese Taipei. There was a slight hiccup for the Korean duo in the second game, but apart from that the match went swimmingly for Kim Minseok and Kim Donghyun (11-8, 8-11, 11-6, 12-10). Next up are the home contenders Zhang Jike and Ma Long; will Kim Minseok and Kim Donghyun be able to raise their game to a high enough degree to cause an upset victory in the last eight? Just the one match went ahead in the Women’s Doubles draw after Lee Rou You and Ng Sock Khim (both Malaysia) withdrew due to injury problems putting Korea Republic’s Lee Yearam and Kim Haeun through to the next round. 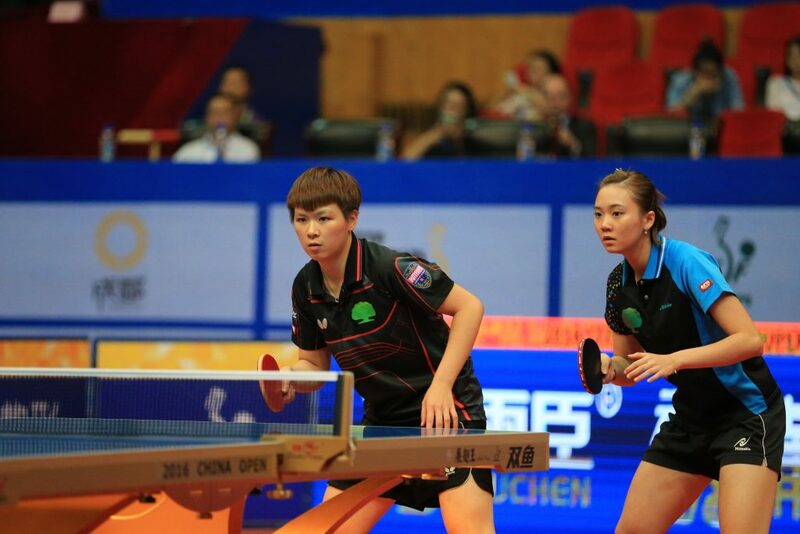 The tie that did feature action was between Chinese Taipei’s Cheng Hsien-Tzu and Chen Szu-Yu and Zeng Jian (Singapore) and Chang Li Sian Alice (Malaysia). Cheng and Chen were by far the more effective of the doubles pairings and before long a 3-0 win came their way (11-1, 11-2, 11-8). The reward for Cheng Hsien-Tzu and Chen Szu-Yu, a meeting with Shan Xiaona (Germany) and Jiang Huajun in the quarter-finals.